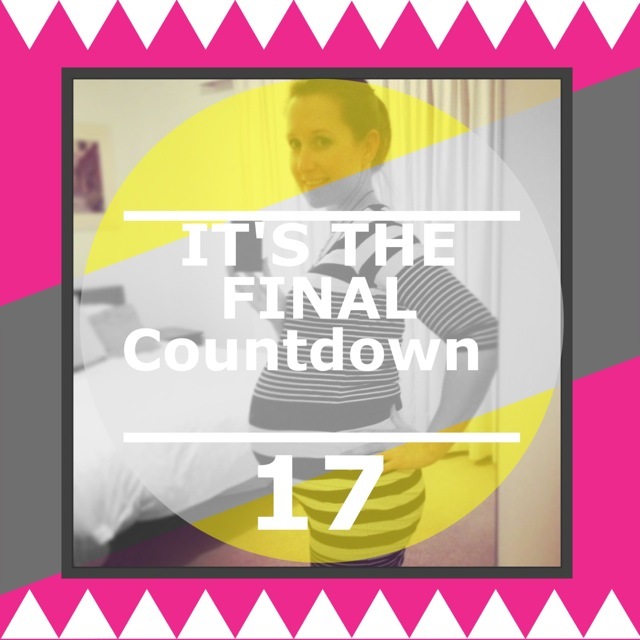 17 days until baby's due date. Am I ready? BRING IT ON!!!! Baby has been stretching and hiccuping so much in my belly these past few days. I think he's trying to find some more room to stretch himself out. I often feel him digging into my right hip, or see a big lump pop out on my right side where his foot must be, then I see the whole left hand side of my belly push out at a weird angle where his bottom must be. It's freaky and amazing all at once. And I cannot believe how often this baby gets the hiccups! I reckon it's at least 4 times a day, sometimes it wakes me up at night when I feel the rhythmic pulsing inside my belly. That's not all. I now have a love/hate relationship with bed-time. When I sleep, I sleep so well; but there comes a fair bit of discomfort from being in bed for so many hours. I need to get up for bathroom trips every 2-3 hours, and sometimes that means 4 trips. I seem to wake up every time I need to roll over because I'm struggling with my big belly causing back aches in bed. I have pillows stuffed along my left and right side, so I can manoeuvre them under my belly, or between my knees, or to prop my back up. I seriously can't imagine how people manage with twins or triplets in their belly! Most nights, I lay awake from about 3:30am - 5am. The tiredness has begun to affect my work-days now, so I've given my boss notice that I'll be finishing work next Wednesday 12th June. The following day I'll reach 39 weeks of pregnancy (if baby doesn't arrive sooner). I originally planned to work up until 2 days before the due date, but I'm realising how crazy that is. I'm listening to my body and knowing that rest is important for me at this stage of the pregnancy. It's become such a struggle to catch the train to and from work; especially when the carriage is overflowing with people at peak hour in the morning. I'm lucky enough to always get a seat at my station, but within the next 2 stops there is barely any standing room left. With all those squashed people standing in the aisles and entrance doors, people don't realise that a pregnant lady is trying to squeeze past them to get off the train; and I often get elbowed in the belly. It's friggin' exhausting! Every day I wonder if today will be the day that I go into labour. Will he come early? Will he come late? I wonder how the whole process will begin? Will it be the dramatic water-breaking moment? Or will it be a more confusing subtle onset of labour from back pain and cramping that becomes more intense? Who knows?! My hospital bag is packed, the nursery is ready and I am so looking forward to reaching the point of meeting our son for the first time! So exciting! You are almost there. I am so excited for you!!! It's the final countdown!!!! I'm glad you're listening to your body and planning to rest more. An earlier exit from work sounds like a good plan. Wow!! Its almost here. All the best.